The first thing we see is Anna Fleischle’s Fifties-tastic giant doll’s-house set: each period-perfect room bathed in a different twinkling hue, flowers painted onto the brick wall, and jaunty music setting the tone. 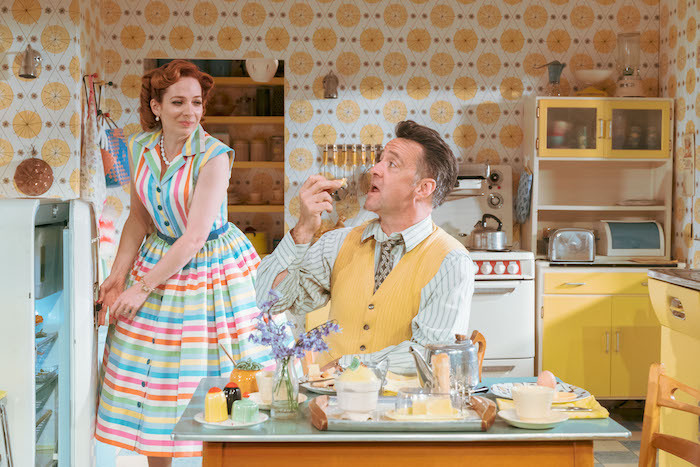 But Katherine Parkinson’s Judy is able to open the front wall like a folding door – clearly establishing that this life, and this contentment, is just a façade. This entry was posted in Dance, Journalism, Theatre and tagged anna fleischle, book tickets, broadwayworld, feminism, feminist, fifties, hello i'm darling, home, homemaker, jive, katherine parkinson, laura wade, london, marriage, national theatre, nostalgia, review, sian thomas, tamara harvey, theatre, visit london, wife, women. Bookmark the permalink.